Disappointingly, the Galaxy S4 Active gives you only the Polaris Office viewer functionality, instead of the full-fledged editor. The viewer does not show up in your app drawer, but instead only opens when you select the relevant document from the My Files app. Nevertheless, you can view most document types, including PowerPoint, Word, Excel as well as PDF. It can present the document as is or reflow the text to fit on the screen. There's also a text to speech option, so the phone can read the doc out loud (it will also offer to install a better TTS engine, which weighs in at about 100MB). The S Planner fills the role of your calendar app, and can be viewed by Day, Week, Month or Year, or by a list of all your upcoming tasks or events. The small squares for each date give only limited info on the events for the day, but thanks to Air View you can point to a day to read the full description of events. Adding a new event is quick and easy, and you can also set an alarm to act as a reminder. There is also a calculator aboard. It is nicely touch optimized - the buttons are big enough and easy to hit. The Samsung Galaxy S4 Active features a decent alarm clock application which allows a huge number of alarms to be set, each with its own start time and repeat pattern. There's also a World clock, stopwatch, and timer. They are easy to work with and can come in handy. We've been familiar with the S Memo app ever since its debut on the Galaxy Note, and its functionality remains more or less the same. It allows you to create notes either via a virtual keyboard or simply by doodling with your finger. Samsung even sell a special display-friendly ball pen for enthusiasts. The Samsung Galaxy S4 Active comes with a GPS receiver, which got a satellite lock in couple of minutes with A-GPS turned off. A-GPS can speed this up quite a bit, but requires Internet access. The barometer, however, can speed up GPS locks even without a data connection. With a screen as large (or larger) than most dedicated SatNav units, with excellent sunlight legibility and plenty of storage, money spent towards satellite navigation should go to buying a good app rather than a separate SatNav unit. 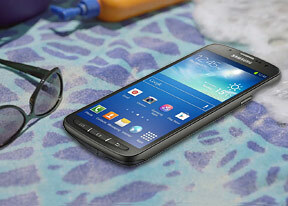 The Galaxy S4 Active comes with Google Maps and Navigation. Voice-guided navigation has become a viable solution since the v5.0 update. Vector maps are smaller and easier on the data traffic and reroute is an option if you go off course without the need to connect to the Internet. In fact, the only time you need a data connection is when you initially plan the course - Navigation will cache the needed maps. Quite naturally, the app also supports the Street View mode. If it's available in the area you're interested in, you can enjoy a 360-degree view of the surroundings. When the digital compass is turned on it feels like making a virtual tour of the location. If Google Maps Navigation doesn't do it for you, you can grab an alternative app from the Android Market - there are both free and paid ones. The Google Play Store features several scrollable tabs - categories, featured, top paid, top free, top grossing, top new paid, top new free and trending. Apps usually have several screenshots (some even offer a demo video) so you can get an idea of what the app looks like before installing it. You can also check out comments and ratings, as well as the number of downloads and so on, to help you decide if the app is worth it. The Google Play Store is full of all sorts of apps, but in some countries it also offers music, movies and TV shows, books and magazines. Samsung Apps features largely the same type of interface as Google Play, except here you'll find a far lower number of apps. The good news is Samsung uses this repository to distribute some exclusive titles and some promotional offers, available only to its customers. Samsung also offers a store for books and games through Samsung Hub. The Book also offers a preview - the first few pages of a book. You can read reviews of the book, written only by people who have bought it. You can also read a synopsis, about the author and search for more books by that author. The Games section of Samsung Hub just launches Samsung Apps when you tap on a game.